Currently, I am reading Franklin and Eleanor by Hazel Rowley. I am enjoying it, not only because I didn't know that much about the Roosevelts (which means "field of roses") before, but also because they were such extraordinary people. The Roosevelts were definitely ahead of their time in their thinking about many social issues, and also in their relationship with each other and their extended "family", which would even be regarded as unusual today. Being a foodie, I immediately seized on a throw-away sentence that stated that one of Franklin's favourite meals was Brunswick Stew, a Georgian speciality. FDR spent a lot of time in Warm Springs, Georgia, to undertake therapeutic swimming for his polio-stricken lower limbs, and it was there that he discovered Brunswick Stew. 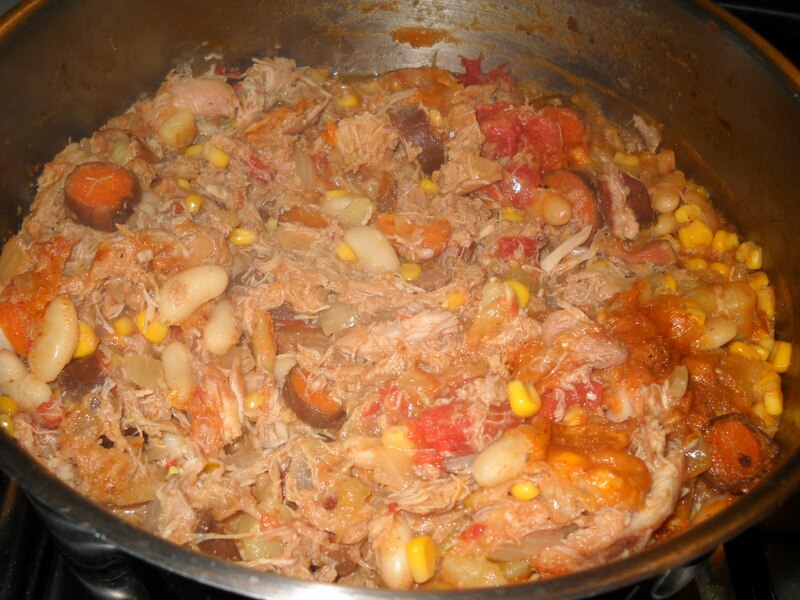 In Franklin and Eleanor, Brunswick Stew is described as a "chicken and pork dish". Accordingly, in honour of FDR, I decided to make a version of Brunswick Stew containing chicken and pork. Although the end product is delicious and a meal in itself, I liked even better how the dish tasted at the half way point, before you fish out the celery and bacon, and before adding the vinegar and cooking it some more. When Penny says in her post that it tastes like the best chicken soup ever at that mid-stage, she is absolutely right - if I made this stew again, I think I'd leave it right there, because it is salty and rich and wonderful at that stage. The addition of vinegar and lemon adds an acidity which takes away from the simple saltiness, and although the end product still tastes good, I like the mid-point better. You could easily get away with quartering this recipe, but to give myself an easy life, I just halved it. I also recommend setting aside a lazy Sunday afternoon like I did to make it, as there are numerous steps and cooking times, which are rather time consuming. 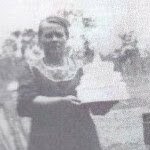 If you have a historical interest in what FDR liked for dinner or are curious as to what Brunswick stew is, give this recipe a burl - you won't be disappointed. This stew looks great! I'll have to get a copy of that book to read over my vacation. My dad always made Brunswick stew with chicken, because we lived in the city, but I believe squirrel or rabbit is the traditional way to go, although I don't think my mom would have gone for that, especially since we had a pet bunny for 12 years. My dad always added lima beans, as well. His recipe was based on his Southern upbringing and the Brunswick Stew we ate at Colonial Williamsburg on a family vacation. Isn't it funny how "traditional" recipes are never the same from one cook to another? This looks like a perfect Sunday afternoon meal. You know, the sad thing is I've never tried this! yours look great with nice clicks.. I've heard of Brunswick Stew, but had no idea what it was. How neat that the book was an inspiration for your cooking. Never heard of this stew before but it sounds delicious. Never heard of Brunswick stew but it sounds - and looks - heavenly; a lovely winter warmer!